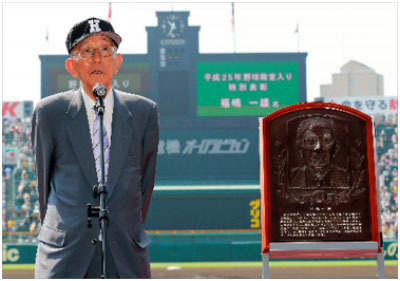 Kazuo Fukushima, one of the 3 inductees of the Baseball Hall of Fame in Japan for 2013, stood on the ground of Koshien Stadium on August 15, 2013 for the first time after 64 years since he pitched for Kokura High School (Fukuoka) to win the national high school championship for two consecutive years in 1947 and 1948. He played for Waseda University (won 4 times at Tokyo Big-6 League) and Yahata Iron and Steel (won National Champion of JABA’s Industrial League), and currently serves as President of JABA Kyushu Region. Hall of famers in Japan now numbers 180.